Arab and Islamic history have witnessed the emergence of many Arab Islamic intellectuals who have had a clear impact on the Islamic movement. Some of them have died, such as Sayed Kotb, while others are still alive. 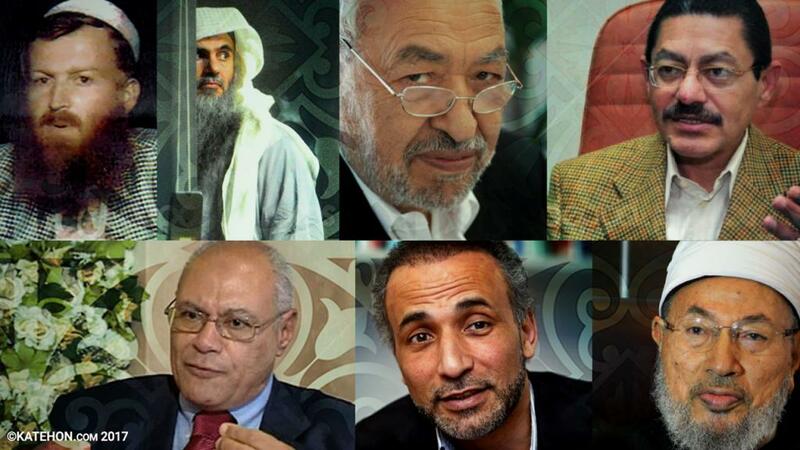 In this article, we will try to identify the ten most prominent Arab Islamist Intellectuals who directly influenced the Islamic movement whether the Salafi Movement, the Muslim Brotherhood, or Salafi Jihadism. From the "Fighting Vanguard", Abu Musa'ab Al-Suri or Mustafa Set Mariam, who studied mechanical engineering and specialized in explosive engineering science, was born in 1958 and started his Jihadist activity in Aleppo. His organization, led by Marwan Hadid was like an armed faction of the Muslim Brotherhood in Syria. Abu Musa'ab was trained by Egyptian and Iraqi officers due to the dispute at that time between the Egyptian and Iraqi regimes on the one hand and the Syrian Ba’athist regime on the other. The former tended to support the Muslim Brotherhood against the Syrian Baath regime. During the battles of Hama, Al-Suri held the position of “coach" in the bases of the military apparatus of the Muslim Brotherhood in Jordan and Iraq. Then he was appointed by Saeed Hawa to be in charge of Syria's Northwest area of the Muslim Brotherhood. After a short time, Al-Suri made his first rebellion against the Muslim Brotherhood when it reconciled with the regime after the massacre of Hama. Al-Suri justified his attitude at that time with the ideological imbalance within the organization of the Muslim Brotherhood. Abu Musaab Al-Suri, like some others like him, have lost support and therefore fled to Afghanistan, where he knew Abdullah Azzam and took over the training of the Mujahideen coming to Afghanistan. There he also knew the leader of Al-Qaeda, Osama Bin Laden. The relationship between them strengthened up to the point that Al-Suri became one of the theorists of Al-Qaeda and a contributor to its establishment. Al-Suri also had a close relationship with Sayed Imam, from whom Al-Suri learned his sciences from his books. Sayed Imam became the supervisor and reviewer of Al-Suri's writings at the beginning, as with his book The Syrian Experience. In Afghanistan, Al-Suri also worked on educating himself by reading the books of Ibn Al-Qayyim, Ibn Taymiyyah, Abdullah Azzam and Sayed Qotb. Al-Suri also received a Bachelor of History from Beirut Arab University in Amman by the Distance Learning System. Al-Suri then went to Britain and took charge of the leadership of Algerian media’s jihadist wing. As a result of the rumors that the group had been infiltrated by the French and Algerian intelligence, Al-Suri left the group and in London founded the “Office of the Conflicts of the Islamic World Studies" and broadcast interviews with Osama Bin Laden on British satellite channels. Abu Musaab Al-Suri returned again to Afghanistan when the Taliban declared the establishment of its state and formed supporting field groups. He also founded the Al-Ghuraba Camp and "Al-Ghuraba Center for Islamic Studies and Media", as well as issued a magazine under the title "Issues of the Triumphant Group" magazine. After the fall of Taliban, Al-Suri retired from his field work and devoted himself to authorship and research, but the United States spurred him back again into field work due to the declaration of a financial reward for any information on him. Al-Suri was arrested in 2006 in Pakistan, then deported to Syria and was held in prison until 2012. Some information indicates that the Syrian regime had released him in defiance of America. Al-Suri news disappeared after that time until La Rozan, a Spanish newspaper, indicated that he had assumed the leadership of ISIS’ military wing. In general, the The Call for a Global Islamic Resistance book is considered one of the most distinctive contributions of Al-Suri which outlines the general guidelines of jihadist groups` strategies. This book involves a summary of the four different jihadist experiences in Syria, Afghanistan, and Algeria, as well as during different time periods through which Salafi Jihadism has passed. Moreover, Abu Musaab is considered the first founder of the stages theory which expresses the strategy of Al-Qaeda regarding the establishment of the Islamic State. In 1960, the city of Beit Al-Sohour in the West Bank witnesses the birth of Omar Mahmoud Othman who is known as "Abu Qatada Al-Filistini". When he was three years old, he left with his family for Jordan, where he stayed during his first educational stages. During his secondary school, he joined the Islamic Preaching and Call Movement "Al-Tabligh Wal Dawah" and proceeded with it until he reached the age of sixteen. After he passed the secondary stage, he travelled to Pakistan where he stayed for four months and worked with the Al-Tabligh Wal Dawah Movement. By entering into the academic stage through studying in the Faculty of Sharia at the University of Jordan and his deep studying, he started criticizing the Al-Tabligh Wal Dawah Movement for undervaluing the importance of learning. Consequently, he gradually left the Movement, but he refused to join the Muslim Brotherhood. Such an attitude was based on the justification that he had previously been a preacher, and therefore his interest in the preaching aspect was greater than the political one. Thus, he is oriented towards traditional Salafism. Even when he had the option in recruitment to be either in compulsory military service or the military casuistry, he chose the military casuistry in spite of the fact that the period of such service is double the period of compulsory military service (4 years). His turning to Salafi Jihadism has initiated since his end of military service, as he has engaged in the political aspect as well as organizing activity. He, in cooperation with his companions, established a magazine bearing the title of “Al-Manar”, the printing of which was supervised by Hassan Abu Haniyah, whose activity in this regard coincided with the return of parliamentary elections in Jordan in addition to the emergence of the Islamic Salvation Front in Algeria and the subsequent effects on the Islamic Movement in general. As a result of Iraq’s occupation of Kuwait, Abu Qatada opposed the actions of Saddam Hussein and rejected the inauguration of Saddam as well as refused to consider him to be the Imam of Muslims. He also rejected Saudi Arabia’s allowing of the entry of American forces. Therefore, he faced pressure in Jordan which compelled him to travel to Malaysia in order to join the Islamic Group "Al-Jama`a Al-Islamiyyah". Al-Filistini worked on giving juridical courses to the members of the Islamic group in Malaysia, but he did not stay there for a long time, as he has spent four months before traveling to Pakistan in 1991 where he gave juridical courses to the Muslims living there, in particular the Libyan fighters who later joined the Libyan Islamic Fighting Group "Al-Jama`a Al-Libeiyah Al-Muqatillah". On the other hand, the role of Abu Qatada in Afghanistan was of a mere juridical nature, without being involved in armed activity. After the fall of Kabul to the Afghani factions and pressure was put on Arab fighters there, Abu Qatada travelled to Britain. In Britain, Abu Qatada proceeded with giving speeches at his house in London, then in a hall called the “Fourth Feathers". Through his preaching and speeches, Abu Qatada influenced the followers of Salafi Jihadism, in particular the Algerians in addition to his support for the armed Algerian group. In 2001, Abu Qatada began to face harassment, especially after the explosions in France carried out by Algerian citizens. Such harassment ended in putting him in prison for 12 years. In 2013, he was delivered to Jordan on the basis of a judicial Jordanian-British memorandum. In Jordan he was retried and found to be not guilty in 2014. Abu Qatada has many publications which are considered among the most important references within different Salafi Jihadist trends, the most prominent of which are The Features of the Triumphant Group, "Al-Arba`on Al-Jiyad Le Ahl Al-Tawheed Wal Jihad", "Al-Jihad Wal Ejtihad", The First Basics in Creating Humans and State, and The Jihadi Teaching and Sacrifice. Mohamed Emara is one of the most prominent thinkers and theorists of the Islamic movement. He was born in 1931 in the Egyptian countryside of the Kafr El-Sheikh Governorate. He proceeded with education until receiving a PhD degree in 1975, the title of his dissertation of which was "The Theory of Imamate and Governing Philosophy at the Mu`tazila". His movement activity was initiated by joining a left wing camp, the Young Egypt Party, and he stayed in the party until its name changed to the Socialist Party. By the uprising of the July Revolution and the end of the era of political parties in Egypt, Emara turned to work in the left wing camp until he was arrested. In prison (1959 – 1964), he underwent an intellectual revision which ended with his exit from the left wing camp and turn towards the Islamic movement. Since then, Emara has been classified as an independent Islamist intellectual who does not belong to a specific Islamic movement. He has turned to criticize existing movements. However, he has a positive tendency towards the Muslim Brotherhood, having declaring that it is the largest Islamic movement on the Egyptian scene. The publications of Emara have discussed various topics ranging from rejecting the Marxian idea of class struggle and to its Islamic replacement as an alternative to solve social problems. In addition, he has investigated the role which he thinks the Egyptian Church played in Christianization that created a state of enmity. In general, the publications of Emara are numerous, including more than 60 writings, all of which indicate his point of view as well as that of his loyalists who revolve around the Path of Islamic Moderation (Al-Wasatiyah Al-Islammiyah). Mohammad Salim Al-Awa is one of those who are classified as being part of the trend of Islamic moderation. He was born in 1942 in Alexandria. The origins of his father go back to the country of Syria. Al-Awa proceeded with educational stages until he obtained a PhD Degree in law comparing English and Islamic Jurisprudence in one of the faculties affiliated to London University in 1972. In relation to his intellectual activity, Al-Awa admits that he is working within the framework of a project bearing the title "The Moderate Islamic Civilization Project" which is based on molding humans in addition to working on establishing organizations which will likely rebuild human formations. Consequently, he has written a lot of publications within such framework, the most prominent of which are Our Family between Religion and Ethics, The Political Regime of the Islamic State, The Islamic Fiqh in the Way of Renewal, and The Coptic and Islam. In fact, Al-Awa does not care much for political activity. In spite of the situations for which he is remembered like his detention in 1965 during the era of President Gamal Abdel Nasser due to being a member of the Muslim Brotherhood group, his attitude during the conflict period between the Islamic Group " Al-Jama`a Al-Islamiyyah" and the regime of Egypt, and his attempt to end the clash and stop violence - despite these instances, his political activity began only in the post-January Revolution period starting from being elected by the Egyptian Military Council to be among the members of Egyptian Consultative Board. Then he turned to nominate himself as an independent candidate during the presidential elections of 2012, but failed and came in sixth place. The most distinctive feature of his nomination campaign was his election of the Citadel of Salah El-Deen from which to initiate his electoral program due to its symbolism. Abroad, Al-Awa has been chosen to be the general secretary of the “International Union for Muslim Scholars" which was created by the Islamist Yusuf al-Qaradawi in 2004. He has also worked as a professor of Islamic Fiqh and comparative law at the University of King Saud, formerly University of Riyadh. Rachid Al-Ghannouchi was born in 1941 in one village of the Gabes Governorate in Southern Tunisia to a modest family working in agriculture. He proceeded with his education between his village and the schools of the Gabes Governorate. Then he moved to the Tunisian capital where he studied at the University of Al-Zaytoonah and acquired a certificate in the Foundations of Religion (Asoul Al-Deen). From there, he has travelled to Cairo in 1964 in order to study agriculture at the University of Cairo. Due to the disagreements at the time between Habib Bourguiba and Saleh Bin Yousseif, Tunisian students were prevented from staying in Egypt. Therefore, Al-Ghannouchi went to Damascus where he obtained a bachelor degree in philosophy in 1968, following which he tried, through his trip to Europe, to complete studying at Sorbonne University, but he was unsuccessful and subsequently returned to Tunisia. The timing of his return to Tunisia coincided with the measures taken by Bourguiba to support religious education as a means to face down the Marxist tendencies in the state. So, Al-Ghannouchi initiated his preaching career from Tunisia by working with students and scholars in secondary institutes within the framework of citizenship and public liberty issues. He joined Abdel Fattah Morro in the "Society of Preserving the Holy Quran" which was considered the core which formed the Islamic Group in Tunisia in 1972, which later issued the “Al-Ma`arefa Journal" as a communication link with the Tunisian community. Through the Journal, Al-Ghannouchi explicitly accused Bourguiba of fighting Islam and attempting to concentrate secularism in the Tunisian community. Such clashes and disagreements between him and Bourguiba represented the main reason behind his detention more than once, the first of which was in 1981 when he was sentenced to prison for 11 years but released in 1984 as part of a general amnesty. In 1987, he was re-arrested and sentenced to imprisonment for life. But due to the coup launched by Zein Al-Abdeen Bin Ali in the same year, the sentence was not carried out and he was released the following year. In 1989, Al-Ghannouchi applied with an official request to legally license the Movement of Islamic Trend. This request was rejected and the relationship between him and the regime deteriorated further, which led him to travel abroad and stay outside Tunisia until the uprising of the Tunisian Revolution. Since his return to Tunisia after the Jasmine Revolution and the removal of Bin Ali, Al-Ghannouchi has been very well received by the members of the Tunisian Renaissance Movement "El-Nahada". The movement ran in the elections of the Constituent Council, gaining 90 seats out of 217 in 2011. However, Al-Ghannouchi has not shown any desire to hold any political position. Thus, he nominated "Hammadi Al-Gebali" to take over the presidency of the Tunisian Government. In the legislative elections in 2014, the Al-Nahda Party took second place after the Call of Tunisia Party "Nidaa Tunis”, the party which played an important role in the leadership on the Tunisian scene. Al-Ghannouchi has published many works such as Rights of Citizenship in the Islamic State, A Woman between the Quran and the Reality of Muslims, The Islamic Movements and the Issue of Change, and Convergences in Secularism and Civil Society, but the most distinctive of them is General Liberties in the Islamic State issued in 1989. Despite being of the Christian religion and the fact that our essay concerns the 10 most prominent contemporary Arab Islamist intellectuals, it is no exaggeration to say that Rafiq Habib is the first thinker of the Egyptian Muslim Brotherhood. Rafiq Habib was born in 1959 in Cairo into the Evangelical community. He studied psychiatry and gained a masters degree in 1985 from the Faculty of Arts at Ain Shams University, and then he obtained a PhD degree from the same university in 1988. His relationship with the Muslim Brotherhood began with the idea of establishing Al-Wasat Party, "Center Party.” Habib was among the founders of the party from the beginning before the Mubarak regime rejected the party’s registration. By the time of the uprising of the January Revolution and the establishment of the Freedom and Justice Party "Al-Hurriyah Wa Al-Adalah" by the Muslim Brotherhood, Habib contributed to developing a program for the party in June 2011, and occupied the position of the party’s vice-president. In August 2012, Habib was chosen by the ousted President Mohammed Morsi to be a member of his presidential team. However, due to the Al-Etihadiyah clash between the supporters and opponents of the ousted President Mohammed Morsi, Habib resigned from his position in December of the same year after holding his position for only four months, but he did remain the vice-president of the party. Because of the June events, the removal of Morsi and the detention of Saad Al-Katatny, the president of the Freedom and Justice Party, Habib was chosen by the party to hold the position of acting president of the Freedom and Justice Party. Rahman is a Moroccan Islamist philosopher and thinker who was born in 1944 at Al-Jadidah in Morocco during the Moroccan claim to independence. He completed primary education in Al-Jadidah and then moved to Casablanca in order to complete the secondary stage, and then to Rabat to get a bachelor in philosophy from the University of Mohammed V. Afterwards, he obtained another bachelor degree from Sorbonne University. He also received a PhD degree in 1972, his thesis entitled "Language and Philosophy: A study in Language Structures for Ontology". There is no doubt that Taha Abdul Rahman is considered one of the most distinct and unique contemporary Islamist thinkers, as he has worked on producing a project based on “pure conceptions” of the Islamic heritage free from Western influence. His project combines logical analysis and so-called linguistic derivatives and is void of any political role. On the other hand, Taha Abdul Rahman has many specialized publications such as Language and Philosophy, The Spirit of Religion, The Jurisprudence of Philosophy, Religious Work and Renewal, and The Question of Ethics. Tarek Abdel Fattah Saliem El-Bishry was born in 1933 in Cairo. He studied law at the University of Cairo and graduated in 1953. From an elite family. his grandfather, Saliem El-Bishry, was the Sheikh of the Malikiyah Elders in Egypt, and his father, Abdel Fattah El-Bishry, was the former president of the Court of Appeal. Once he graduated from university, Tarek was appointed to the Council of State. El-Bishry began as a Marxist and then turned to Islamic thinking upon writing an essay under the title “The Renewal Experience in Islamic Legislation” after the defeat of 1967. He became popular in the Egyptian scene during the era of the ousted President Mubarak when he produced a book bearing the title Egypt between the Insurrection and Disintegration. He has maintained his attitude since the Revolution of January which he supported and he has fought to put Mubarak on trial. Upon the emergence of the Military Council, El-Bishry was chosen to be the president of the Committee of Formulating the Constitution. Despite being classified by some as a member of the Muslim Brotherhood, El-Bishry has more than once denied such a classification. The most prominent of such instances was his objection to removing General Prosecutor Abdel Majid Mahmoud from his position by the Muslim Brotherhood and his support for the ousting of President Mohammed Morsi. The most distinctive intellectual contribution of Tarek El-Bishry is, from our point of view, found in the framework of his book Towards a Basic Trend for the Nation, in which he seeks to explain the method which should be followed in order to have a basic trend for the nation inside every generation and era regardless of existing conditions. Tariq Sayeed Ramadan is the grandson of Hassan El-Banna, the founder of the Muslim Brotherhood. Tariq is the son of Wafaa Hassan El-Banna. He is the son of the Muslim Brotherhood leader Sayeed Ramadan who was exiled from Egypt during the era of Gamal Abdel Nasser, from where he went to Switzerland. Tariq was born in 1962 in Geneva. He obtained a masters degree in philosophy and French literature as well as a PhD degree in Islamic and Arabic studies from the University of Geneva in Switzerland. In Egypt, he received specialized training in classical Islamic texts from professors and sheikhs from Al-Azhar University. Tariq became well-known as a result of the debates he engaged in in the West. These include his famous debates with a group of the French-cultured Jews, during which he accused them of absolutely supporting Israeli policy in the Middle East,and his debate with the French Interior Minister under Nicola Sarkozy in 2003 over the hijab. Western countries have appraised Tariq Ramadan on more than one occasion. On the one hand, in 2008 he was declared to be the eighth greatest thinker in the world in addition to being described by The Washington Post as the "Martin Luther of Islam". Moreover, he has been classified by Times as being the most important modernizers in the 20th century. In general, there is an ongoing debate Western society over classifying Triq Ramdan. Some people consider him to be a modernizing jurist, while others think that he is an extremist who represents a danger threatening all of Europe trying to stabilizing extremist Islam with the approaches of the imposition of Sharia and civilizational Jihad. The popular Muslim Brotherhood theorist Yusuf Mustafa Al-Qaradawi was born in 1926 in the Al-Gharbiyah Governorate in the Arab Republic of Egypt. He first studied at the Al-Azhar Institute and then joined the Faculty of the Foundations of Religion at Al-Azhar University where he obtained a bachelor degree in 1953. In 1954, he obtained a PhD degree in teaching Arabic In 1958, he also received a diploma from the Supreme Institute of Arabic Studies in language and literature. His educational process continued with the obtaining of a degree equivalent to a master degree in the sciences of the Quran and Sunnah from the Faculty of the Foundations of Religion in 1960. After another 13 years, he obtained a PhD degree from the Faculty of the Foundations of Religion for his dissertation, "The Zakat and its Impact on Solving Social Problems". He has Qatari citizenship. Besides his education, Al-Qaradawi is considered – as we have indicated – to be the most prominent contemporary theorist in the history of the Muslim Brotherhood group which he joined at a young age. He has also been arrested more than once for being one of its members, the first time in 1949 when he was a student at the secondary stage, and also in 1954. He has written a book about the Muslim Brotherhood under the title The Muslim Brotherhood: Seventy Years of Preaching, Teaching, and Jihad. Al-Qaradawi has issued many Fatwas (advisory opinions) which have raised controversy, for which there is no room currently. The latest of them was the clash that happened between him and Abdullah Bin Zayed Al-Nahyan, the Emirati Minister of Foreign Affairs, regarding his fatwa on suicide operations. This led to a long clash on Twitter. Surrounding this, some people regard Al-Qaradawi to be a war criminal, while others believe that he is a national expert.